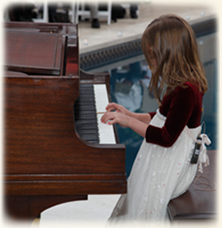 Every child can reach his or her full musical potential when given the proper guidance and training. Students need to be continually engaged, challenged and motivated to maintain the desire to further their music education. In order to sustain a sense of enthusiasm, an encouraging piano method is essential. Through the Shilla Hekmat Piano Method™, students develop confidence and skill through the use of an innovative teaching approach. This series combines all the elements necessary to develop a well-rounded music foundation. Though it is geared toward a younger audience, we have seen adults enjoy it just as much. Students are introduced to sight-reading, technique, theory and piano repertoire in a cumulative manner that allows them to become comfortable with each application before they continue on to the next. In this manner, all components of a solid piano education are accounted for. Through the use of a Visual Reward System™, children are motivated to practice new concepts on their own, instilling in them a sense of confidence and independence. Utilizing this approach, they are taught to take their musical education into their own hands. Parents and piano teachers are very influential in the students' musical education. When parents show enthusiasm for their child's efforts and communicate openly with the piano teacher, learning how to play the piano can become an exciting journey. The value of a strong music education will last a lifetime. A key component of the Shilla Hekmat Piano Method™ is the Visual Reward System™, which is built on the principle that children love games. When piano education is introduced in a fun, interactive manner, students become passionate about the material and learn more quickly than they would under traditional teaching methods. Because they can visualize their improvement, students become more personally invested in their music education. Parents, too, can track their childrens' progress.The Visual Reward System™ has two components: an oversized, graphic chart that is displayed in the piano studio (The Student Success Chart) and a series of interactive elements that are built directly into the book series.